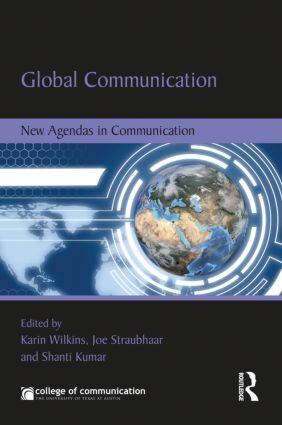 This volume interrogates what "global" means in the context of "communication," and who benefits from global communication practices and industries. Emerging scholars contribute their unique perspectives in communication scholarship, charting innovative directions for research that connects empirical evidence with pressing questions of social significance. This critical reflection leads to considering problems that result from the way global communication becomes mobilized, in the practice of journalism and development as well as the ICT industry. Global Communication defines the term "globalization," through understanding the cultural geography of global, regional, national, and local media. Critical evaluations of media production, distribution, and consumption practices, within cultural contexts, offer insights into how people "mediate" the global. Chapters draw attention to communications in Latin America, the Arab World, and South Asia, complicating territorial boundaries and exploring how local audience and industry practices work within global as well as local configurations. Mobilizing Global Communication: For What and for Whom? Karin Wilkins serves as Professor of Media Studies, Associate Director with the Center for Middle Eastern Studies, and Chair, Global Studies Bridging Disciplines Program at the University of Texas at Austin. Wilkins has won numerous awards for her research, service and teaching. Her work addresses scholarship in the fields of development communication, global communication, and political engagement. Joseph D. Straubhaar is the Amon G. Carter Centennial Professor of Communications in the Department of Radio-TV-Film at The University of Texas at Austin. He is also Director of Media Studies for the RTF Department. He was the Director of the Center for Brazilian Studies within the Lozano Long Institute for Latin American Studies, 2003-2006. His primary teaching, research and writing interests are in global media and cultural theory, media and migration, digital media and the digital divide in the U. S. and other countries, and global television production and flow. Shanti Kumar is an Associate Professor in the Department of Radio-TV-Film at the University of Texas at Austin. He is the author of Gandhi Meets Primetime: Globalization and Nationalism in Indian Television (University of Illinois Press, 2006), and the co-editor of Planet TV: A Global Television Reader (New York University Press, 2003). He has also published book chapters in several edited anthologies and articles in journals. His research and teaching interests include global media studies, cultural studies, Indian cinema and television, and postcolonial theory and criticism. This series brings together groups of emerging scholars to tackle important interdisciplinary themes that demand new scholarly attention and reach broadly across the communication field’s existing courses. Each volume stakes out a key area, presents original findings, and considers the long-range implications of its "new agenda."